Josie Leavitt has been performing stand-up for longer than she can remember. Getting her start in New York City in the 1990s, she played at Stand-Up NY, Caroline's, the Comic Strip and many other clubs. She has the distinction of winning the Funniest Westsider contest in 1993. And that was a great year for Westsiders in NYC. In 1996 Josie and her then partner moved to Vermont to start an idyllic life in the country, only to open a bookstore and then never go outside again. After running the store for ten years, Josie missed stand-up and started performing and teaching stand-up. Since then, she performed throughout the country and taught more than 300 aspiring comics. Josie Leavitt has also created the longest running series in Flynn Theatre history, with the wildly popular stand-up showcase: Stand-Up, Sit Down and Laugh. Now in its 14th year, the series has been a sold-out favorite in Burlington since 2005. Check out the cover story Seven Days did about me in September 2018 in advance of my two night sold one-woman show So This Happened at the FlynnSpace in Burlington. 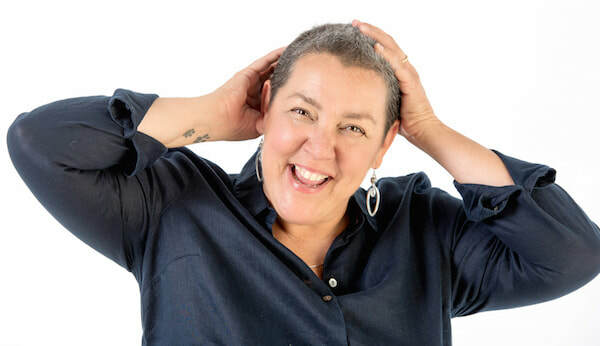 Turning a breast cancer diagnosis into a one-woman show seemed like the only thing I could do. I won the Best Comic award in the Vermont for 2014 in the Seven Daysies. Check out the link here. More news: I won the Moth Story Slam in Burlington on October, 14th 2014.The GrandSlam is October 9th, 2015 at the Flynn MainStage. The votes have been counted and I'm thrilled to say that I won the Best Comic award in Vermont for 2015. Read more about it here. The Daysies keep rolling in! Won again for Best Comic in 2016 and 2017.